We have a block of rooms set aside at the Hotel Indigo Boston-Newton Riverside, http://www.newtonindigo.com/, at a conference rate of $189.00/night. NOTE: The hotel discount is only for rooms booked through the end of September 2015. At this point people will need to call the hotel to see whether or not any rooms were still available at that rate. There are additional options for lodging – subject to diminishing availability. This hotel is nearby Brandeis and the Indigo hotel. The government rate offered by this hotel is at the federal per diem rate: $136 per night. Parking and breakfast are both additional. The rate is significantly more for AAA members but breakfast is included. At both the Indigo and the Marriott hotels the cost per person for a double room would also be at the federal per diem rate. This applies where two people are sharing a double bed room. Only the Indigo includes free parking and is actually on the green train line. Airbnb offers rooms close by to Brandeis University. These are without cooking facilities. Public transportation would generally not be accessible for these locations. Recent prices for one individual are below the federal per diem rate. 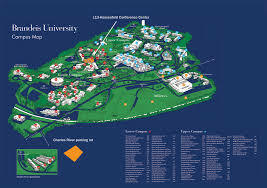 Our host institution this year is Brandeis University! The conference will take place in the Goldfarb Library and directly across the street in the Usdan Student Center. 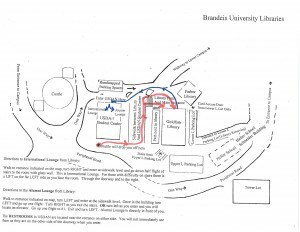 In the campus map below, the Goldfarb Library and the Usdan Student Center are buildings U20 and U21. There will be a shuttle from the parking lot to the library, where we have meeting space. It is a short 15 minute walk. It is about a 20 minute walk, some up-hill, or use a shuttle that will go back and forth throughout the day. The shuttle will be easy to identify, and the site is working on getting signs in the window. There should be enough room in the lot. There will be a shuttle from the parking lot that does continuous loops. There will be a sign in the window. There will also be a sign on South Street directing attendees to the J-lot. If you’re in Boston without a car, you probably want to take the subway to North Station (green/orange line) or Porter Square (red line) and catch the commuter rail out to Brandeis station. Subway fare is $2.65. And Commuter Rail is $6.25 to Brandeis from either of the above stations. I actually live in Cambridge, MA (I telecommute most of the time, so my carpool offer is from Cambridge not NYC. Wondering if anybody else who’s going to be at the Hotel Indigo on Wed. evening is interested in carpooling to the 99 Restaurant get-together?